CommentMonitoring data has shown declines at some populations. Extent and severity of declines is uncertain. CommentSpotted knapweed is impacting populations, particularly in Ravalli County. Score 11 to 13 total points scored out of a possible 19. Sapphire rockcress is a small perennial with one to many unbranched flowering stems reaching up to 30 cm in height, arising from a simple or branched rootcrown. The spoon-shaped or lance-shaped basal leaves are 10-30 mm long and 2-4 mm wide, and have margins that are untoothed or with a few shallow lobes toward the tip; those produced in the fall are usually larger and broader than those produced in the spring. The stem leaves are smaller and clasping at the base. Both stem and leaves are grayish-white with a dense cover of small, branched hairs. Several to many white or blueish-tinged flowers are borne in an unbranched spike-like inflorescence. Each flower has 4 petals (9-13 mm long and 3-5 mm wide) and densely hairy sepals (6-7 mm long and about 2 mm wide). The flowers are tightly clustered at first, but become farther apart as the fruits develop. The pods are grayish, hairy and 3-5 cm long by 1-2 mm wide; they are held nearly erect when mature and have two narrow chambers with a single row of small seeds in each one. Sapphire rockcress flowers from late April to early June. The relatively small size and densely hairy erect fruits of Arabis fecunda are distinctive. Several other species of rockcress have erect fruits, but Arabis hirsuta and A. glabra are taller and have larger leaves, and Arabis drummondii, A. divaricarpa and A. lyallii are glabrous rather than densely hairy. 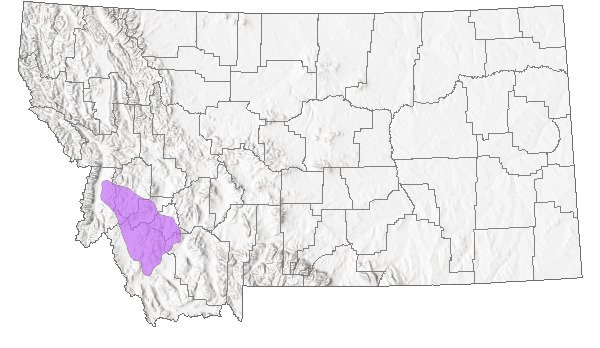 Montana endemic, restricted to Ravalli, Beaverhead, and Silver Bow counties, Montana. 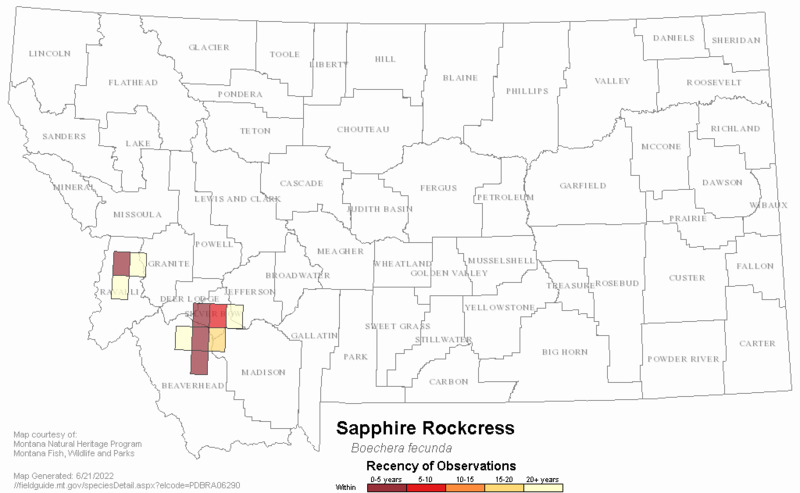 Sapphire rockcress is endemic to the Northern Rocky Mountains, where it is known only from the mountains of southwest Montana. It grows on moderate to steep slopes with warm aspects (SE, S, SW, W) and sparse vegetation. In Ravalli County, it is typically found in steppe communities of Artemisia tridentata, Festuca idahoensis and Agropyron spicatum, sometimes with a sparse overstory of ponderosa pine. In Beaverhead and Silver Bow counties, it grows in Cercocarpus ledifolius - Juniperus scopulorum or limber pine woodland, very open Douglas-fir forest, or sparse Agropyron spicatum grassland. Most populations are in lower slope positions, although some occur on middle and upper slopes. Sites in the Sapphire Mountains are at or below 5000 feet, while populations farther south are at 5500-8000 feet. Sapphire rockcress occurs on soils derived exclusively from calcareous sediments that have been metamorphosed to some extent by contact with granitic intrusions (Lesica 1993). Soils are generally sandy in texture with low organic matter content and a light albedo. Soil analyses from the Charley's Gulch site in Ravalli County indicate a silty-sand texture and high calcium content. Parent materials from Ravalli County belong to the Wallace Formation in the Precambrian Belt Series, while those from Beaverhead and Silver Bow counties are Paleozoic Madison limestone. Sapphire rockcress grows in areas of relatively sparse vegetation on steep slopes with periodic natural erosion. Periodic erosion and slumping of steep slope habitat may be partially responsible for maintaining sparse vegetation and reducing competition for light, water and nutrients (Lesica 1993). Many sites would be considered early successional or edaphic disclimaxes, and these conditions may be important for species persistence. At three sites in Ravalli and Beaverhead counties, coverage of rock varied from 2-15%, coverage of bare soil varied from 40-77%, and coverage of basal vegetation varied from 19-48% (Lesica and Shelly 1994). Some slopes support cryptogamic soil crusts that are beneficial to the survival of older, larger plants of sapphire rockcress (Lesica and Shelly 1992). Fire was relatively frequent in many of these areas, but the sparse vegetation on the slopes occupied by this species probably did not carry fire well. Genetic research suggests that Bitterroot Valley populations of sapphire rockcress may be distinct in their adaptation to survive drought conditions (McKay et al. 2001). Several factors may affect the long-term persistence of this species, including exotic weed encroachment, grazing, herbicide application, mining and pathogens. Livestock grazing occurs at most sites, although fewer than half are reported to have heavy grazing. Direct herbivory has never been observed and is probably rare, however, soil crusts are beneficial to the species' survivorship at some sites; such crusts are often destroyed by livestock. Livestock can also adversely affect survivorship by trampling plants. Exclosure studies were conducted at two sites near the Big Hole River. At one site sapphire rockcress increased in the grazing exclosure while decreased in another. Sapphire rockcress establishes best when not competing with other species, and grazing may limit competition. It is interesting to note that some of the largest populations (Birch Creek and Jerry Creek) are in areas with the most intensive grazing. Spotted knapweed (Centaurea maculosa) poses a major threat to populations in Ravalli County, where it has severely invaded this species' habitat. Studies indicate that knapweed reduces the successful establishment of sapphire rockcress seedlings. Spotted knapweed is an aggressive Eurasian weed present at all sites in Ravalli County. This taprooted perennial is widely introduced in North America where it has become a serious invader of semi-arid grasslands in the Pacific Northwest and intermountain valleys of the Northern Rocky Mountains. Its ability to invade and replace native plants is well documented. Most of our Arabis fecunda sites have severe infestations of spotted knapweed. Research on water use efficiency in this species has shown significant differences between low-elevation populations in the Bitterroot Valley and those at higher sites in Beaverhead County, suggesting that Bitterroot Valley populations, which are most threatened by weed encroachment, may be genetically distinct. Roads are a major source of weed infestation, and road construction or other major disturbances can introduce or provide avenues for the introduction of weeds. Livestock can also be a significant vector for exotic weed encroachment. Currently, spotted knapweed does not occur at the Beaverhead or Silver Bow County sites, but it does occur in these counties and may become a problem. Little is known about the effects of herbicides on sapphire rockcress, so it is advisable to avoid herbicide application in direct proximity to populations. 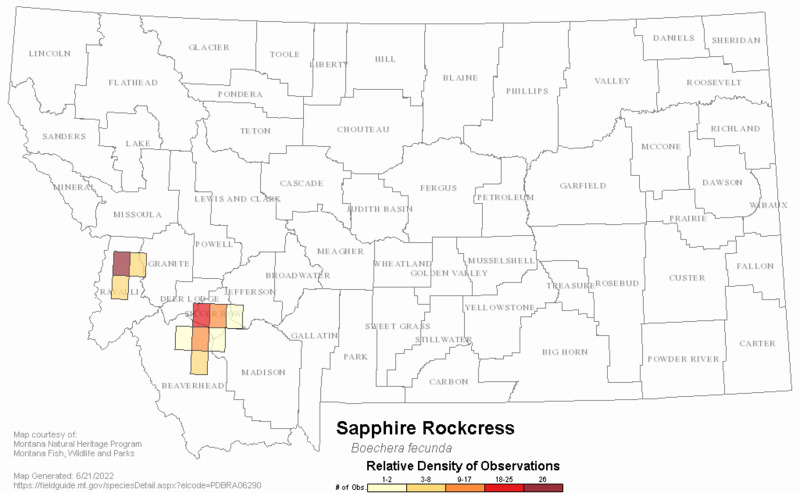 Only one sapphire rockcress site is near an active mine, and has not been impacted to date. Other populations are near mining claims or inactive mines that could become active with improved extraction methods or increases in the value of minerals. Hamilton, M.B. and T. Mitchell-Olds. 1994. The mating system and relative performance of selfed and outcrossed progeny in Arabis fecunda (Brassicaceae). American Journal of Botany 81(10): 1252-1256. Lesica, P. 1991. Demographic monitoring of Arabis fecunda in the Pioneer Range, Beaverhead National Forest, Montana, 1989-1991. Montana Natural Heritage Program, Helena. 42 pp. Lesica, P. 1992. The occurrence of Arabis fecunda on BLM lands in the Humbug Spires area, Silver Bow County. Unpublished report to the BLM. Montana Natural Heritage Program. Helena, Montana. 6 pp. Lesica, P. 1993. Effects of grazing on Arabis fecunda: 1993 progress report. Unpublished report for the Bureau of Land Management, Butte District. Montana Natural Heritage Program, Helena, MT. 6 pp plus appendices. Lesica, P. 1993. Report on the conservation status of Arabis fecunda, a candidate threatened species. Unpublished report (update) to the U.S. Fish and Wildlife Service. Montana Natural Heritage Program, Helena, MT. 52 pp. Lesica, P. 1994. Sensitive plant survey of BLM lands along the Big Hole River and in the Whitehall Valley. Montana Natural Heritage Program, Helena, MT. 13 pp. Lesica, P. and J. S. Shelly. 1993. Demographic monitoring of Arabis fecunda populations in the Sapphire and Beaverhead Ranges, Montana. 1992 progress report. 20 pp. plus appendix. Lesica, P. and J. S. Shelly. 1996. Competitive effects of Centaurea maculosa on the population dynamics of Arabis fecunda. Bulletin of the Torrey Botanical Club 123(2):111-121. Lesica, P. and J.S. Shelly. 1991. Demographic monitoring of Arabis fecunda in the Pioneer Range, Beaverhead National Forest, Montana: 1990 progress report. Unpublished report. Montana Natural Heritage Program, Helena, MT. 30 pp. Lesica, P. and J.S. Shelly. 1991. The effects of the introduced weed Centaurea maculosa on Arabis fecunda, a threatened Montana endemic. Prepared for Montana Natural Heritage Program, Helena, MT. 15 pp. plus appendix. Lesica, P., and J.S. Shelly. 1992. Effects of cryptogamic soil crust on the population dynamics of Arabis fecunda (Brassicaceae). American Midland Naturalist 128: 53-60. Lesica, P., and J.S. Shelly. 1994. Demography and life history of Arabis fecunda in Ravalli and Beaverhead counties, Montana. Unpublished report to the Beaverhead National Forest. Montana Natural Heritage Program, Helena, MT. 29 pp. Lesica, P., J. S. Shelly. 1995. Effects of reproductive mode on demography and life history in the Arabis fecunda (Brassicaceae). American Journal of Botany 82 (6): 752-762. McKay, J. K., J. G. Bishop, J. Lin, J. H. Richards, A. Sala and T. Mitchell-Olds. 2001. Local adaptation across a climatic gradient despite small effective population size in the rare sapphire rockcress. Proceedings of the Royal Society of London 268: 1715-1721. Mincemoyer, S. 2005. Surveys of significant plant resources and related vegetation types for the Butte Office of the Bureau of Land Management. Montana Natural Heritage Program, Helena, MT. 11 pp + appendices. Mitchell-Olds, T. 1991. Electrophoretic variation in Arabis fecunda, a rare endemic of western Montana. Unpublished report prepared for the Montana Natural Heritage Program, Helena, MT. 8 pp. Schassberger, L. A. 1988. Conservation status of Arabis fecunda, a candidate threatened species. Unpubl. Rep., USDI Fish & Wildlife Service. 36 pp. Schassberger, L. A. 1990. Conservation status of Arabis fecunda, a candidate threatened species. Unpubl. Rep., USDI Fish & Wildlife Service, Denver, CO. 16 pp. Schassberger, L.A. 1990. Status review of Arabis fecunda USDA Forest Service - Region 1 Beaverhead National Forest. Unpublished Report. Montana Natural Heritage Program, Helena, MT 45 pp. Walsh, R. 1992. Demography of sapphire rockcress (Arabis fecunda Rollins: Brassicaceae), a rare endemic Montana species [M.S. thesis]. Univ. Montana, Missoula. 95 pp. Web Search Engines for Articles on "Sapphire Rockcress"